On 9 December 2010, with financial assistance from American Express Europe, we were fortunate to secured one of the most important surviving drawings by Charles Augustin Busby, the Regency architect of Brighton & Hove and a winner of the Royal Academy's Gold Medal for architecture. 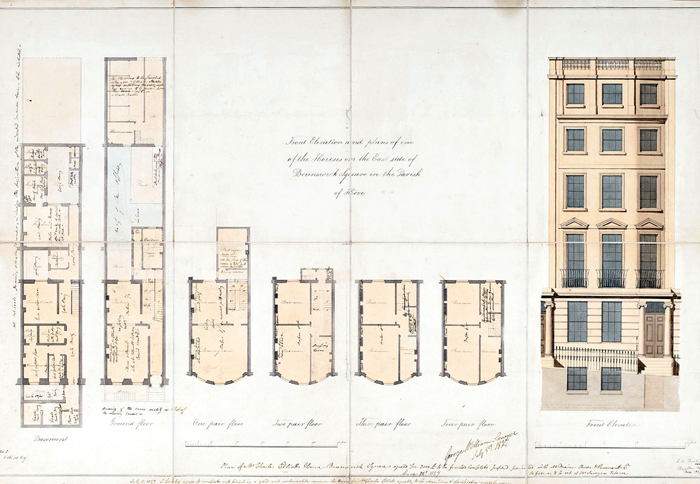 The work, a 36 x 24 inch, 1826 coloured plan and elevation of a Brunswick Town terraced property was, for many years, the centrepiece of Anthony Dale's collection, founder of the Regency Society and author of Fashionable Brighton. Upon Mrs Dale's death, who succeeded her husband by some years, the drawing was auctioned at Gorringes in Lewes and The Brunswick Town Charitable Trust*, was able to purchase the work for £6,000 (with commission and VAT, £7,233.75) on behalf of The Regency Town House archive. This will place the work directly within the setting of Brunswick Town, Busby’s greatest architectural achievement, and but a few doors away from the actual building depicted. The building of Brunswick Town was a co-operative arrangement between Busby as architect, the Reverend Thomas Scutt as landowner and the speculators who bought into the project and funded the construction of the individual properties. A part of Busby’s role was to produce seductive, hand-coloured drawings to evidence to how the finished houses might look. The equivalent of today's glossy printed brochures, these were intended to encourage the speculators to buy into the project and, if required, enable them to sell-on the property while still unfinished. One of the Estate’s most active speculators was Charles Elliott and this particular drawing depicts one of his houses in Brunswick Square. What makes it especially interesting is that it also carries the details of Elliott’s arrangement with his builder, George William Sawyer, who has signed the document on 5th July 1827, as he agrees to finish the property for Elliott at a cost of £3,000. 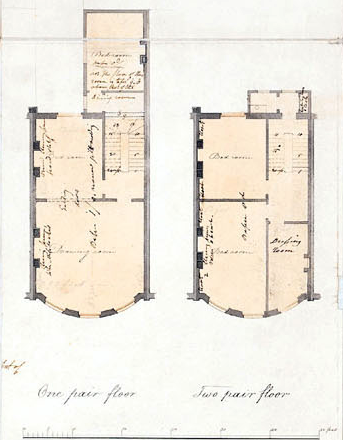 On the sheet, in Busby's hand, can be seen the names given to the various rooms in the property, while the speculator and builder have added notes about such matters as the cost of wall paper, floor finishes and bedroom cupboards. This drawing is the only know fully worked-up elevation for a Brunswick property and some 183 years after it was first made, the Trustees and officers of The Brunswick Town Charitable Trust are proud to bring it home to Brunswick Town. To cover the costs of purchase, conservation and interpretation, the Trust is seeking to amass £10,000 and, to help reach this target, is offering high quality prints of the drawing. Please consider assisting us by ordering your copy today. The offer, set out below, is open until further notice. Larry Bray Photography and Spectrum Photographic Ltd have been responsible for capturing the image, colour management and reproducing the prints which are produced on Hahnemühle archival quality paper and with archival quality pigment ink. This combination provides for high quality copies on paper and inks of a quality comparable with the materials that would have been used by Busby when he first made and coloured the original drawing. The Brunswick Town Charitable Trust - registered UK charity number 1012216.